In 1899, newsboy Kid Blink led a band of real life orphan and runaway “newsies” on a two-week long strike against Joseph Pulitzer, Randolph Hearst and other powerful newspaper publishers in New York City. This historic youth-led campaign was the subject of the 1992 Disney film Newsies. Now, on March 29, only a few days shy of the 20th anniversary of the film’s release, Newsies has become a great big Broadway show. The wheels were set in motion last fall, when Newsies was rapturously received by the New York critics who’d ventured to the Paper Mill Playhouse in Millburn, New Jersey. Entertainment Weekly said, “Broadway could use a burst of good Newsies,” whileNewsweek echoed the sentiment: “It’s not even on Broadway yet, and it’s already the talk of the town.” Shows in this part of the world don’t often get national TV coverage, but this one did. What’s more, Paper Mill was filled with long-time fans who spread the word, not to mention much-impressed newcomers. President of Disney Theatrical Productions Thomas Schumacher, seeing crowds act as if Elvis had just entered the building, felt that Newsies was genuinely being called to Broadway. In truth, it wasn’t planned this way. Because Music Theatre International had had so many requests for amateur productions of Newsies, Schumacher simply decided to develop a stage version for high schools, colleges and community theater. While the film wasn’t a mainstream hit, it has in the last two decades become a grass roots cult hit thanks to home video. There aren’t that many musicals that have enough admirers to get themselves named – such as Rent’s “Rentheads.” But there are enough rabid fans of Newsies that they too required a nickname all their own. The staunch fans – 73,183 at last Facebook count – came down to brass tacks when simply calling themselves “Fansies.” It’s direct, and does tell it like it is. There will be more “Fansies,” thanks to this new Broadway incarnation. 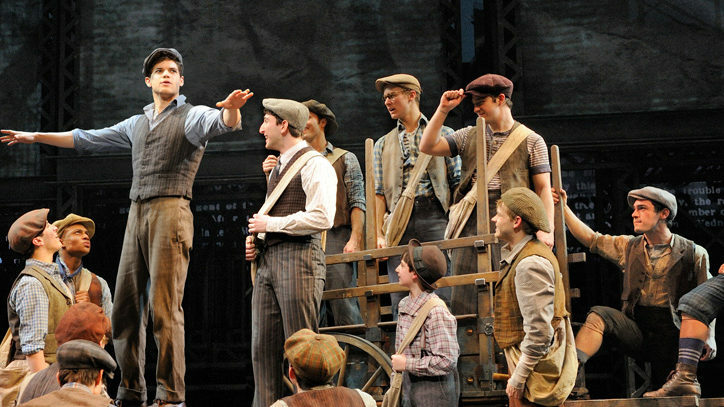 In 2012,Newsies speaks even louder to much of America than it did in 1992. The lads’ rallying cry that “There’s a change coming once and for all,” and that “Now is the time to seize the day!” are words that are currently heard in many parks and streets across the land. Jack Feldman’s lyrics were set to super-charged music by no less than Alan Menken, who’d already won four Oscars (for The Little Mermaid and Beauty and the Beast) when the Newsies film debuted. He’s since won four more (for Aladdinand Pocahontas). Now Menken and Feldman have combined favorite songs from the film with brand new material. Even the venomous Pulitzer would get to sing about the joy he took in his power. But even the existing film score received some polishing. The songs benefitted from new lyrics and equally new arrangements. But who could write a book for the stage? Menken knew one writer who had much affection for the film: Harvey Fierstein, one of the very few writers to win a Tony for penning a play (Torch Song Trilogy, which ran three years) and musical (La Cage aux Folles, which ran four). That Fierstein was also an important building block in the smash hit Hairspray (for which he won a Best Musical Actor Tony) didn’t hurt, either. The best musicals improve on their source material. Fierstein would do that, although he would keep the solid foundation of Bob Tzudiker and Noni White’s screenplay: that newsie Jack Kelly may not have the best grammar, but his rhetoric is powerful enough to rally his peers to fight the seemingly insurmountable Pulitzer. In the film, the boys find an ally: a rival newspaper’s reporter who’s willing to tell their story – at least until matters get too dangerous. Fierstein, however, changed Bryan Denton into Katherine Plumber. An 1899 woman who wants a career is an especially worthy and fascinating character. Katherine, however, needs the newsies as much as they need her. The genteel society pages aren’t enough for her. Katherine wants to be on the front (and front page) exposing real-life wrongs. Thus, the newsies’ David against Goliath battle is tailor-made for her, as she expresses in song. That Katherine has a secret that isn’t revealed until deep in Act Two is another important Feinstein ingredient. By adding Katherine, Fierstein’s script becomes richer. Musicals, after all, have embraced romance since the days of Naughty Marietta and Rose-Marie, not to mention the Maria who fell in love with Tony as well as the Maria who came to love Captain Von Trapp. That Jack is attracted to Katherine is now a vital part of the story. Another Fierstein masterstroke was giving Jack the ability to draw and paint. The young man’s work is what first intrigues Katherine; so there is some sensitivity in this seeming ruffian. Once again, art has the power to persuade. By the end of the second act, Katherine and Jack are singing together. But there’s still that strike. Fierstein retained Pulitzer’s attempt to divide and conquer by buying off his adversary. At first Jack succumbs, which astonishes the other newsies. And when love turns to hate, there is no stronger hate. Add to that the contempt he gets from the Pulitzer contingent, too. No one respects a turncoat – even the people who buy him. That Pulitzer refuses to take back the unsold newspapers turns out to be an important plot point, too. What Fierstein has happen (that Tzudiker and White did not) is historically accurate, too. As is the policy of the best Broadway librettos, matters become pitch-black darkest before the dawn. Still, it wouldn’t be much of a musical if virtue didn’t triumph at the end. Fierstein kept Tzudiker and White’s plot twist of having Pulitzer hoisted on his own petard. And what better deus ex machina could a musical hope to have than to have one of the most beloved figures in American history make a last-minute appearance? After seeing Jeremy Jordan at an early reading, Calhoun cast him as Jack. Once he realized that the show would be closed by mid-October, he also selected him as the lead in his upcoming musical of Bonnie & Clyde; after all, it would head into rehearsals just as Newsies was closing. And so, the Newsies are back home in New York. Fierstein has Jack say early on, “You ain’t to blame for where you’re born. But where you wind up is a whole ’nother story. At show’s end, Jack says, “We will work with you. We will even workfor you. But we will be paid and treated as valuable members of your organization.” They’re words that resonate strongly to Americans in 2012.